Some San Gabriel Valley bars offer female companionship for a small price and authorities are starting to take notice. County supervisors may direct staff to begin negotiations toward pension reform with unions. The biggest news from this weekend is this story about former Monterey Park City Manager and current Glendora City manager taking home nearly half a million dollars in leave time after he departed from Monterey Park in 2007. I will address this more in a later post. The Monterey Park Police Officers’ Association on Wednesday came out in support of a former police chief who received $576,000 in pay and benefits during his last nine months of work for the city. In a report published last week, it was revealed that former police chief Jones Moy collected more than half-a-million in pay and benefits in 2009. A significant portion of that money, $372,000 stems from unused time-off Moy cashed out before leaving. It was also revealed earlier this week that Moy and eight other top city officials are eligible to receive three months off a year they can cash out at 100% of their highest pay. Semerena came to that conclusion by alleging Moy’s payout was publicly posted earlier this year on the city’s website. City officials said Moy’s compensation was not posted online. Semerena has not responded to requests for further explanation of claims made in his letter. I am writing in my capacity as the President of the Monterey Park Police Officers Association in response to last week’s article and op-ed piece about retired MPPD Police Chief Jones Moy. As I read the article I was somewhat concerned about the article’s subtext, which, at least as I perceived it is Chief Moy acted unethically when he was paid for his unused leave time. First, I have known Chief Moy for a number of years, and throughout our professional relationship I can attest to both his dedication to the Citizens of Monterey Park and his commitment to upholding the highest ethical standards of conduct expected of a law enforcement officer. When I read the op-ed piece in which the writer says Chief Moy did nothing “below board” I was somewhat relieved, but the piece contains the accusation Chief Moy and other Monterey Park Police Officers serve for no other reason except to enrich themselves at the expense of the taxpayers. Let me assure you, nothing could be further from the truth. When comparing the pay and benefits the Police Officers of Monterey Park earn to surrounding agencies (do not even bother comparing them to the benefits earned by Police Officers in Beverly Hills, Santa Monica or Torrance) you will note the City’s benefits are not as generous. As an example, the retirement for MPPD Officers has a lower benefit than all but one other municipality in Los Angeles County that participates in CalPERS. Furthermore, in both the article and op-ed piece there is a reference to the City’s budget deficit and the layoffs in which the City recently engaged to balance the budget. What was omitted are the following facts: the City Council has frozen or eliminated ten sworn police officer positions, the sworn officers comprising the membership of the Police Officers Association voluntarily took a five percent pay cut to help balance the budget, and the membership agreed to begin the process for Association members to contribute to their retirement. Finally, another thing not explained in your article is why Chief Moy’s final compensation is suddenly an issue since he received his final pay check with all of the payouts last year, and the information about Chief Moy’s salary and payouts was posted publicly on the City’s website early this year. Therefore, I am left to conclude the reason for excoriating and attempting to humiliate someone who dedicated his entire adult life to the citizens of Monterey Park is a politically motivated act intended to turn the citizens against those who strive to make the community a safe and better place for everyone while couching their true motives behind the veil of fiscal responsibility. I understand everyone in the United States is suffering during these difficult economic times, but I urge you and your readers to remember it is the Police Officers I represent who are on the streets every day and night working to ensure your safety and make the community a better place for everyone. Monterey Park was one of the few cities that we weren’t able to get into our story about council salaries in the San Gabriel Valley. Council members bring in a whopping (sarcasm) $500 a month, plus the standard $30 per redevelopment agency meeting with a maximum four meetings per month. Elected officials also get full city health benefits. During a special meeting Wednesday, the Monterey Park City Council voted 3-2 to dismiss City Manager June Yotsuya. “The decision, because of this economic condition all over the state right now, we decided to go in another direction,” said Councilman Frank Venti. Jim Smith, the city’s interim police chief, will serve as acting city manager, Venti said. Venti said he expects that an interim city manager would be chosen within the next week. “We’re looking for somebody definitely who has city manager experience, with a good, strong financial background,” Venti said. Yotsuya, who served as assistant city manager for the city of Seal Beach before coming to Monterey Park, was appointed in April 2008. She was hired by the old City Council majority, which was overturned in when Betty Tom Chu beat out Sharon Martinez in the last City Council election. MONTEREY PARK – The City Council at 8 a.m. Friday will discuss firing City Manager June Yotstuya, according to a notice from the City Clerk’s office. The council discussed Yotsuya’s contract Wednesday night but failed to make a decision whether to let her go. Yotsuya was hired in March 2008 after months of negotiating by the City Council. She was awarded a salary of $186,000 annually after she was hired in a 3-2 vote. If she is fired, Yotsuya will get 12 months of severance pay, according to the contract approved in 2008. The city’s agenda says the City Council will consider appointing Yotsuya’s replacement. The meeting is in room 266 on the second floor of Monterey Park City Hall, 320 W. Newmark Ave.
I’ve always wondered why Monterey Park Councilman Benjamin “Frank” Venti had that ponytail. Now I know why. Here’s a piece from reporter Daniel Tedford’s story about former Monterey Park Councilwoman Sharon Martinez being charged with several felonies. Venti was happy to hear charges had been filed. When the mailer first appeared in 2007, Venti vowed to grow his hair out until the perpetrators were discovered. “My hair grew and now I got to figure out a day when I am going to cut it and celebrate,” Venti said. Venti said he ultimately hopes to find out what motivated the mailer. I love hair vows. They’ve been popular since the time of the Judges. He then goes on to imply that there is more to be discovered. Another mystery: Why would Venti ditch a cool name like Benjamin for a name like Frank? MONTEREY PARK – County prosecutors have charged former Councilwoman Sharon Martinez with five felonies in connection with a 2007 election campaign mailer. Martinez, 43, was charged on Feb. 26 with one count of conspiracy to commit false campaign advertisement, one count of false campaign advertisement, one count of forgery, one count of use of a counterfeit city seal, one count of perjury and one misdemeanor attempt to dissuade a witness, said David Demerjian, head deputy of the District Attorney’s Office Public Integrity. If convicted, Martinez faces a maximum of five years and four months in state prison, Demerjian said. Martinez could not imeediately be reached for comment. The charges stem from a 2007 election campaign mailer that targeted Councilman Frank Venti, Demerjian said. The mailer contained a letter signed by Venti claiming he was working to oust the city’s fire department and replace it with a contract with Los Angeles County Fire Department, Venti said. The signature on the letter was a forgery and contained a counterfeit city seal, according to the complaint filed by the district attorney’s office. Martinez paid Alhambra political consultant Melrose Castillo $5,000 in cash to produce and distribute the mailer, anonymously, according to the complaint. Castillo is also charged with the same five felonies, according to the complaint. Martinez had served on the Monterey Park City Council since 2001 before she was defeated in a reelection bid last year. 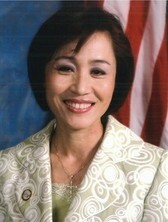 She came in fourth in the March 2009 election when Councilwoman Betty Tom Chu replaced her on the council with an election victory. Councilman David Lau was also reelected that year. 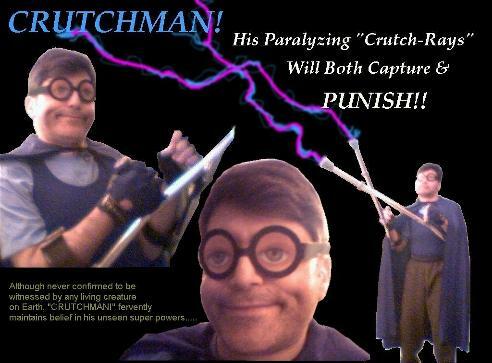 We’ve already seen some interesting campaign tactics and flyers out of Monterey Park City Council hopeful John “JB” Abajian. 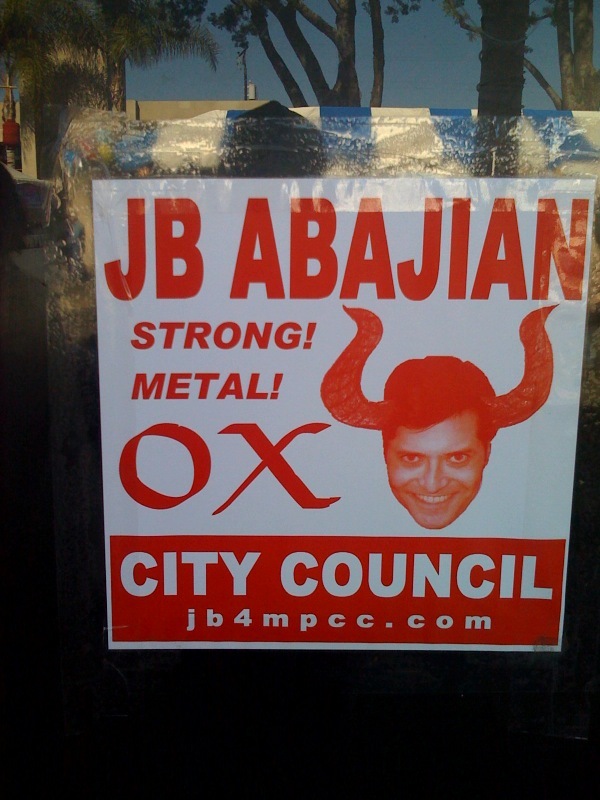 And they’ve also included this campaign flyer that features Abajian with horns, in commemoration with the Year of the Ox. Now, we’ve got something else: Abajian’s very own campaign theme song, “SOS” or “Stamp Out Shenanigans.” Go ahead, take a listen. Meanwhile, reporter Amanda Baumfeld has this story about the council race. No surprise, one the biggest issues, she reports, is a controversial Athens Service trash hauling contract approved in 2002, which is currently under a city audit. Abajian is going up against five other candidates hoping to win two seats: incumbents David Lau and Sharon Martinez, former Councilwoman Betty Tom Chu and residents Joe Ray Avila and Luis Estrada. Mary Su was sworn in Wednesday as Walnut’s first female Chinese-American mayor, Bethania Palma Markus reports today. The change in leadership between former Mayor Joaquin Lim and Sun couldn’t have come at a more contentious time — Walnut is putting up its gloves in a heated battle against Ed Roski Jr.’s proposed NFL stadium in Industry. The project cleared a major hurdle Thursday, getting approval from the Industry Planning Commission. In recent weeks, we’ve heard a lot of speculation from angry residents who argued Lim wasn’t doing enough to fight the planned 75,000-square-foot stadium. But it seems Su’s commitment is being questsioned as well: recall papers have been filed against her and Councilwoman Nancy Tragarz for the same reason.